Karen's Hospitality, Table runner IV (20" x 52.5"). Machine reverse applique. Sign up today for this workshop at Stitchin' Tree for Hand reverse applique. Two days of quilting fun at Stitchin' Tree's lovely Quilters Cottage, and an elegant table runner to show for it! Make our Karen's Hospitality table runner in fabrics that complement your life by hand or machine reverse applique. Be inspired and get tips from the creator and designer, Margaret Willingham. Our hand and machine methods for reverse applique will both be presented, and then you choose how you want to make it. ...For hand stitchers, learn our Trace, Baste, Snip & Stitch process, . The Eye of the Beholder way makes hand reverse applique easier than the traditional method. You will be hand stitching like a pro in no time. 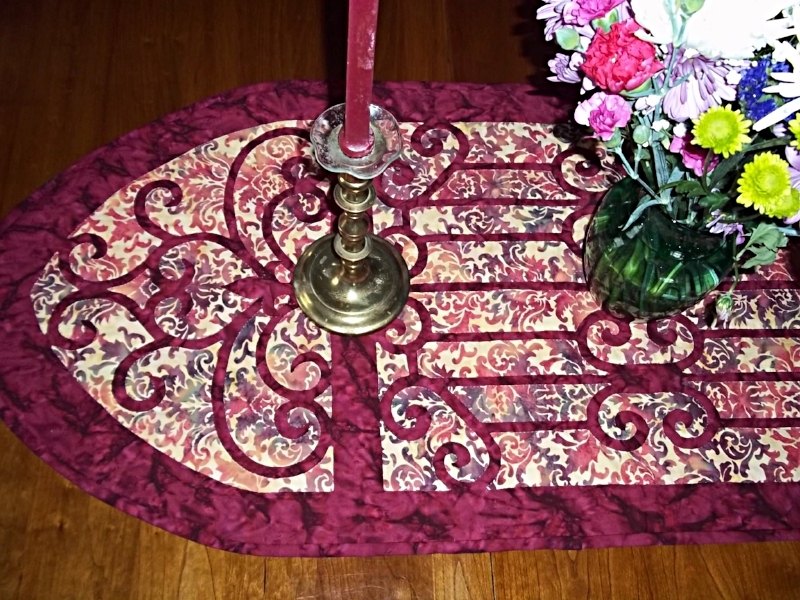 Karen's Hospitality, table runner IV (20" x 52.5"). Hand reverse applique. ...For machine enthusiasts, learn our speedier Trace, Snip, Iron & Stitch process with Appli-quilting. What fabrics will you choose to decorate your home with? See how easy it is to add a touch of elegance to your home. The finishing of your piece will not be part of the scope of this class. However, like any quilt piece, you will layer with your batting and backing, and then quilt. You would need 1 yard of fabric for binding. Contact Stitchin' Tree to sign up. www.stitchintree.com or call 712.647.3161.